A pretty compelling mystery that works in most ways, and features a wonderful ensemble cast. Spotlight is a movie about scandal, coverup, and corruption. It has the right tone, some good acting, and all the right beats about uncovering a conspiracy of sorts. The movie is about breaking down the people who have information and have been a part of the coverup, while they now try to hide the truth from our reporters. There are three specific characters, or levels, of coverup that need to be broken. The first is a lawyer who once tried a case against the Church. The next is a lawyer who represented the vicitims of the Church. Lastly, there is the lawyer who actually represented the wrong doers in the Church organization. This movie is about getting to them one by one, in order to expose the truth. There might not be any single villain or death, or Hollywood twist ending, but that’s just one more way that this film differentiates itself from others that came before it. What the movie does have is a fast pace, a great ensemble cast, and a story that keeps unfolding as the characters discover new information. 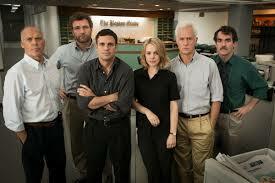 The movie is about a Boston-based News division called Spotlight, that only puts out about one article every few months or so. The reporters who work here spend most of their time doing research and conducting interviews. The Spotlight articles are juicy and controversial, but at the same time, they want to feature stories that people are interested in, without offending their target readers. When the issue of accusing and condemning the Catholic Church comes up, there is definite doubt among the writers and reporters about whether or not they should be tackling this story. After all, Boston is a city that is known for being predominantly Catholic. This all starts with a new boss coming in. Marty Baron, played by Liev Schreiber, is the new man on campus, and the fish out of water, who gets to represent the audience. Only this movie handles that usual kind of approach a little differently. Normally the fish out of water character is the normal guy who brings us into the world of extreme characters and behaviors. He is meant to be an observer, learning the ropes, with the audience seeing the new world through his eyes. Here, Baron comes in and immediately shakes things up. He has no intention of being just an observer or a rookie. Instead, Baron is the one who tells the reporters they need to do this story. It should also be noted that he is Jewish. That’s important because Baron is already seen as an outsider, and having him be of a different religion than the one they are going after, only adds fuel to the fire. When he orders up the story of the Priests in the Catholic Church molesting children, onto the Spotlight team, there is immediate push-back in the ways of argument and debate. There’s a meeting among the writers where all of this is addressed. One of the team members, Mike Rezendes, (Mark Ruffalo,) is left out of the meeting, and moves around the outer office area, trying to ask some of the other people, sitting in the room, what is happening. The debate about whether or not the team should be taking on this story becomes a major source of conflict, from very early on in the film Many of the writers believe this story will alienate their readers and turn them off from continuing with the paper. Baron believes the readers and Bostonians, who are so involved in their religion, will be interested. He goes to meet with the Cardinal to let the man know what they are up to. The Cardinal tells him they all need to work together to put out the same message. Baron disagrees. He’s interested in being truthful about the story, even if it means painting a picture that isn’t exactly glamorous. Baron pushes the writers to begin doing research, and they get on it, starting with a man they bring in who runs a support group for people who were molested by Priests when they were children. The writers on the team include Michael Keaton, John Slattery, Rachel McAdams, Ruffalo, and a lesser known actor, Brian D’arcy James. Other than him, the rest of the cast members are all A List stars, and it doesn’t stop with the team. This movie also features Stanley Tucci and Billy Crudup as some of the players who might have information they are trying to avoid having to share. Tucci plays a lawyer named Garabedian,who once tried to prosecute the Church for these abuses and didn’t get very far. He was shut down and dismissed and felt the power that the Church had over the city. Now, he wants nothing to do with the Spotlight story. Rezendes has to hunt him down and then has to convince him to help, and it is not an easy task. Close to the same level of resistance comes from Eric Macleish (Crudup.) He is a lawyer who used to work for the Church. Like Garabedian, he wants nothing to do with the Spotlight story and basically tells the reporters that he can’t tell them anything without compromising client-attorney priveledge. It is Robinson (Keaton), and Pfeiffer, (McAdams,) who go to see him, and don’t get very far. Unlike Garabedian, however, who just doesn’t want to talk, this guy seems like he is hiding something, and on the wrong side of the coverup. Getting him to talk is even harder than it is with Garabedian, and involves some uncovering of things that could incriminate Macleish. That leads to the reporters threatening him in ways that he can’t just ignore. Another player in the scandal is a lawyer, Jim Sullivan, who is an old friend of Robinson’s. The two of them first talk about the story on a golf course during a friendly outing, where Sullivan tries to persuade Robinson to drop the story. He certainly makes it clear that he won’t be speaking on the matter. Getting this guy to come clean on what he knows becomes a major mission for Robinson and the other characters in the film, and the friendship between the two men is really put to the test, the closer that Robinson gets to figuring things out. There’s one great scene where Robinson even goes to visit the lawyer in his home, and is not met with the kind of reaction he was expecting. One ongoing situation that keeps occurring in this movie is the realization that the case effects way more people than the reporters originally anticipated. Every time a new discovery about this comes up, it is met with enormous surprise. At the same time, they are also uncovering how many priests committed these acts, and that leads to another list of numbers being given to us. That list also keeps increasing throughout the movie. While all of that might seem repetitive, the movie handles it well, giving us ways that the characters make the discoveries, instead of just telling us that the information came to them. The coolest moment of these, comes when the characters figure out a code that the Church uses in their record books, to represent a priest who has been taken out of service due to this sort of scandal and then reassigned somewhere else. The movie works on most levels. There are definitely similarities to Primal Fear here, the movie that introduced Edward Norton to the world and featured one of the greatest twist endings of all time. The difference is that movie was very Hollywood and featured murders behind the corruption. The same can be said of Michael Clayton. 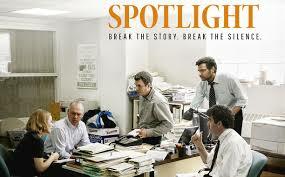 Spotlight is something different. There is no death. There is no individual villain. Instead, we have a movie about the unraveling of a story. In that regard, it is more like All The President’s Men, than anything else. Now we have come to expect the Hollywood ending, with either death or at the very least a twist. No such luck with this film. If we are expecting that one of the reporters on the team has been covering up the story from the inside, for years, we are out of luck. This film stays true and realistic the whole way through, and the result may be a little anti-climatic, but it’s still a pretty powerful film.